At K.K. Penner Tire Centers Inc., we offer full tire service in every application. Whether you need a wheel barrow tire, passenger tire, medium truck tire, farm or earthmover tire, we service and sell whatever your tire needs are! Call us for an appointment today, courtesy cars available (Blumenort location only)! Service Trucks: All locations offer 24-hour after-hours on-site service. Call one of our four locations for more information. Tire Repairs: As well as having a very good stock of new tires, we are also committed to complete, honest tire care and service. 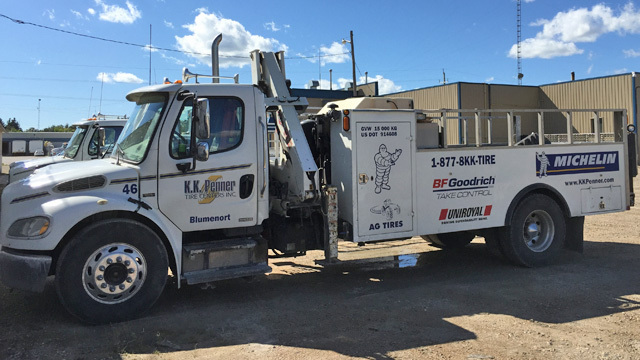 We specialize in spot repairs for tires, including many tires with injuries rejected or destined for disposal. We can repair and get you back on the road with a guaranteed repair. This is both environmentally friendly and cost effective for the consumer. Large Inventory: K.K. Penner Tire Centers Inc. stocks over 6,000 passenger and light truck tires, we are Manitoba’s car and truck tire specialists! Our Blumenort location offers Tire Pressure Monitoring System (TPMS) relearn/reset as well as winter/summer tire storage. 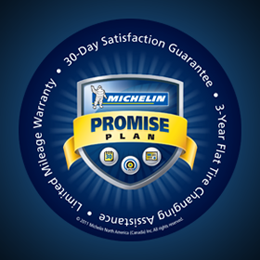 We want you to be 100% satisfied with your MICHELIN® passenger or light truck replacement tires so they are backed by the Michelin Promise Plan.